H.D. Anyone studied literature at U.C. Santa Cruz. 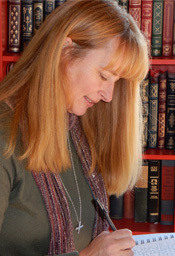 Her aspirations as an author are “to entertain and encourage, to transport and transform.” Her favorite genres are fantasy fiction and any horse story with a happy ending. I was confirmed at St. Luke’s Episcopal Church in 2005. And I was quite nervous about it because I was told that the “laying on of the hands” by the Bishop can be traced back to the original twelve apostles. This seemed so amazing a connection that I feared the ritual would cause me to sob in front of the entire congregation. So, I asked my fellow confirmands to pray that I not break down and become a spectacle. Fortunately, their prayers were answered, for when I stepped from my pew, I tripped and almost fell on my face – an embarrassment that distracted me from sobbing. Strange things would happen during writing, not the least of which occurred the morning I finished the last book. I was trying to decide between two different Bible verses because I wanted to list a verse as my last entry to the entire trilogy. So, I prayed about it and got in my car to take my dog to obedience training. I turned on the Christian radio station, and the verse of the day was one of the two verse I had just prayed about. This seemed a highly improbable coincidence. Needless to say, I went with the verse of the day as I felt it to be an affirmation. My purpose then, as H.D. Anyone (A nom de plume I selected hoping to be self-effacing in a humorous way), is to tell of God’s mercy and steadfast love through novels set in an other-world of fantastical creatures with protagonists battling inner and outer foes.